Shift into a new way of thinking. Remember who you truly are. 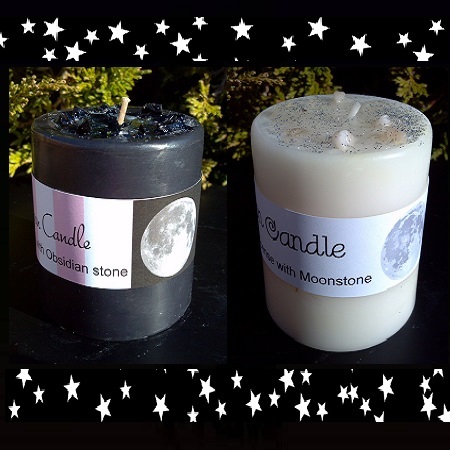 Create and improve your intentions with these wonderful ritual candles created by hand and enriched with natural essential oils and genuine crystals. The cycles of the moon are important when doing any kind of empowerment work in order to manifest what we want in life! When working with the energy of natural cycles, you are likely to get better results with the cycles of the moon since they have great power over the tides of our emotions. Knowledge of the basic cycles of life is an understanding of the forces that motivate and drive us; the forces that affect our lives. *When the moon is NEW, this is considered the time of birthing. Birthing new ideas, intention and seeding new ventures. This is also called the dark of the moon. This time also marks the beginning of a major new cycle in your life. It is not yet a definitive separation with the past, but it is a time when old familiar patterns lose energy and you instinctively feel an impulse for creating new beginnings. Setting your intentions and releasing them out to the Universe to manifest and express. 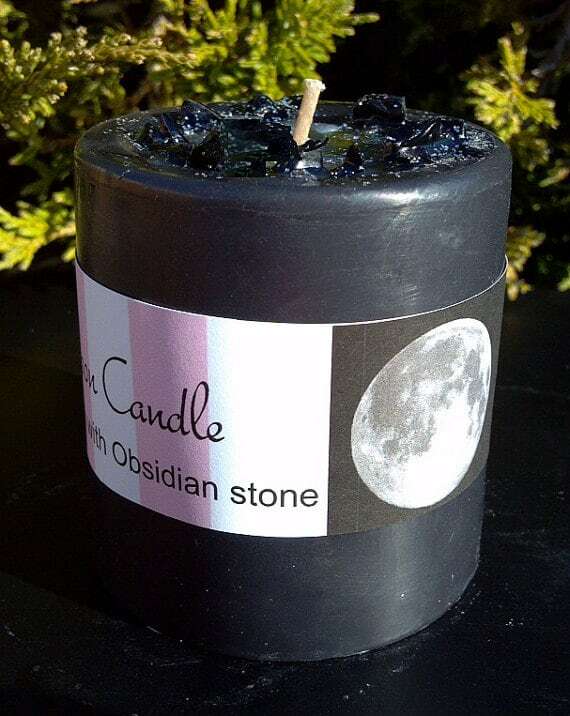 The NEW MOON candle is made with natural essential oils of basil and patchouli and obsidian crystals for grounding, centering, protection and healing. 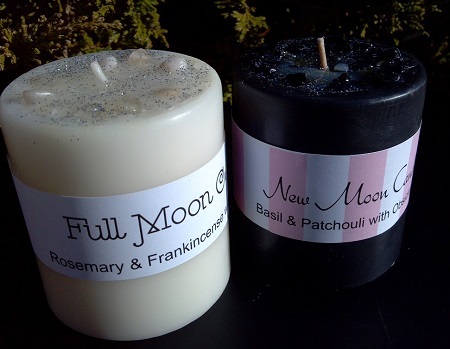 *When the moon is FULL, that is considered the highest time for manifesting goals, nurturing your passions, full scale healing, encouraging strength and power, love, knowledge, legal undertakings, money and dreams. It is the most potent time for rituals for prophecy, protection, divination and any manifesting work that needs extra power. 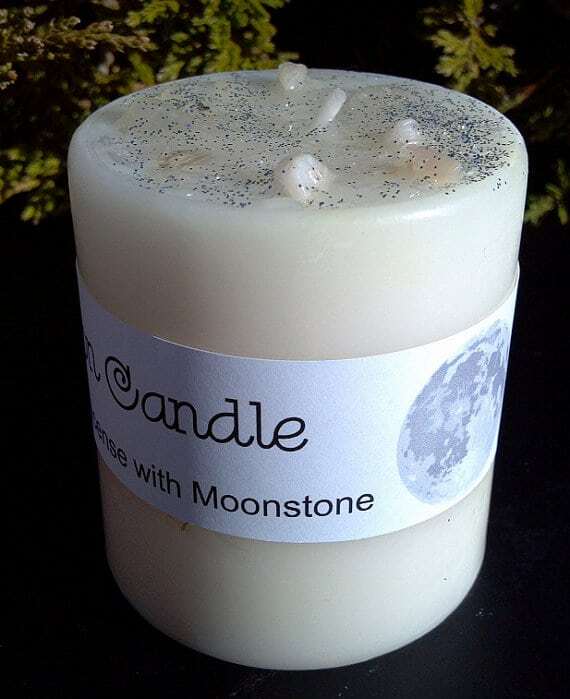 The FULL MOON candle is made with natural essential oils of rosemary and frankincense and a moonstone crystal for enhancing intuition, perception and fruition. These candles are 3″ x 3″. They each have an approximate burn time of 75 hours. They are made with pure essential oils and genuine crystals and are made in USA. Get this ebook FREE by subscribing to our mailing list! What Kind Of Negative Vibrations Attract Arrogant, Violent, Manipulative Partners And How Can I Break This Pattern? A friend of mine kept attracting women that were homeless and who had substance abuse issues. He has a decent job, not on drugs, practical, so from the outside, he’s an average guy. He asked me why he continued attracting women who were homeless and addicted to drugs. Eventually, he came to see this about himself. It was hidden, but he realized he felt a need to save people. What is an effective technique for maintaining a high frequency (energy) around negative situations and people? That is a very good question. We are surrounded by people on a daily basis who have different views on life. Not judging good or bad, just simply different. Which group of websites profit mostly from affiliate marketing? Create A Home Business You'll Love Download Course Now! Now FREE SHIPPING on all orders $50 or more! What is a healthy spirit? A healthy spirit creates a flow of well-being, clarity, and abundance to every aspect of our lives. Since spirit is intangible, to find out its health we will need to use our feelings as a gauge. Want to know how healthy your spirit is? Take the quiz today! Are You In Need For A Lifestyle Change? Take this 21 Day Challenge! Say and do these 10 Powerful Affirmations for 21 days and watch your life transform! Do you love to write and would love to make writing a lucrative business? To Find Out More Click Here! Over 250 Home Assemble And Crafts Jobs!